The Chianti region is probably one of the most well-known Italian wine regions. This area has a markedly different feel from the lush coastal area. Here the vineyards are set in very rocky hillsides and your drive on the very scenic S222 will take you through treed hills. The best bet in this area is to take your time and enjoy the wineries that greet you along the route. 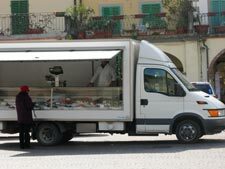 There are 4 towns within a short distance of each other that I drove through, Castellina in Chianti, Radda in Chianti, Panzano, and Greve in Chianti. All great choices for a lunch, walk or wine tasting. I spent most of my time in Greve which is the largest of the towns and is set low along a river. Its main focal point is the busy piazza Matteotii where I was lucky enough to catch a small local festival going on. I stayed in Greve for the night so I asked the hotel front desk for a restaurant recommendation. The owner walked me to his favorite pizza place in town, Via Veneto, that he said is only known by locals. He was right, I was only the third table seated, but by the time I left it was packed with families and groups of friends, and the food was excellent and cheap! 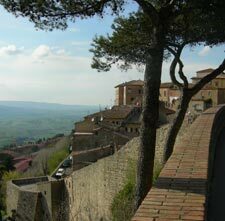 Today I am headed off to the town of Volterra, which is just about an hour west of Siena. 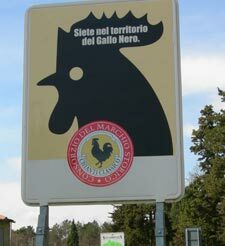 Along the way is Colle di Val d'Elsa which is a beautiful medieval town set on a hill. It is famous for its crystal glassware and art production. As I continue on driving I can see the incredible town of San Gimignano in the distance, its high towers reminiscent of Oz. 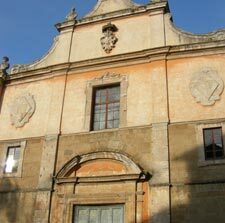 Volterra is most famous for its alabaster craftsman, but it also has several museums, churches, and ruins to visit. This would make a great day for anyone staying around Siena, Chianti or Montaione. The parking areas are clearly marked, and from there you can walk around this pretty sizeable town. My first stop was at the Museo Etrusco Guarino which has an impressive collection of Etruscan artifacts, namely funerary urns. Many of the shops in town sell alabaster, and several shops have the artists working right there. I bought a lovely Alabaster frame at a small shop where craftswoman, Gloria Giannelli was working right there in the shop creating the pieces. There are many choices for dining from pizza spots to sit-down restaurants. I grabbed a slice of pizza from La Mangiatoia to enjoy as I walked around town. If you are still in town around sunset, take the ti me to walk along the path that lines the southwestern side of the town. It's a beautiful path with incredible views to the sea. I was so impressed with this town and would recommend it to anyone.